I made this Stranglekelp farming guide to help out players who want to farm the herbs instead of buying them from the Auction House. Stranglekelp can only be found underwater, and it's recommended to have around Herbalism 85 so you won't get any herb fragments. The single best place to farm Stranglekelp is Thousand Needles, they are literally all over the place underwater and the only aggressive mob you will find are the Remora Scroungers. 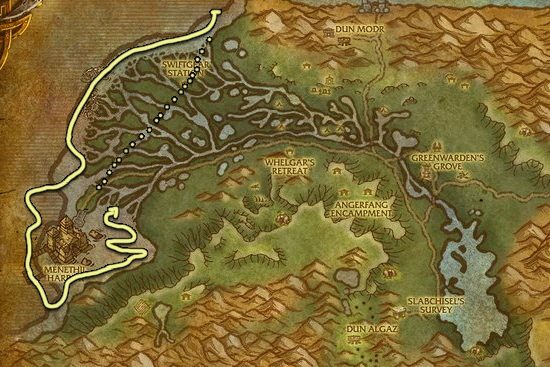 80% of this zone is underwater, but you don't have to worry because after you complete a few quests, you will get the buff Speedbarge Diving Helm which lets you breath underwater and you will swim/run faster. The Grimtotem are Coming - You can get this quest from Caryssia Moonhunter (Alliance) at Feralas or from Kanati Greycloud (Horde) at Thousand Needles. The quest requires level 38. Two If By Boat - WARNING! Do not right click the buff out of curiosity, it does indeed remove you from the boat! After you picked up the quest "Down in the Deeps", you will notice you can swim faster, but you should go to the bottom of the water because at the bottom you will run on land like if you had a ground mount, so it's a lot faster than swimming. You don't have to use your mount, you will run just as fast. You will find Stranglekelp everywhere, but below you can find the route I usually use. 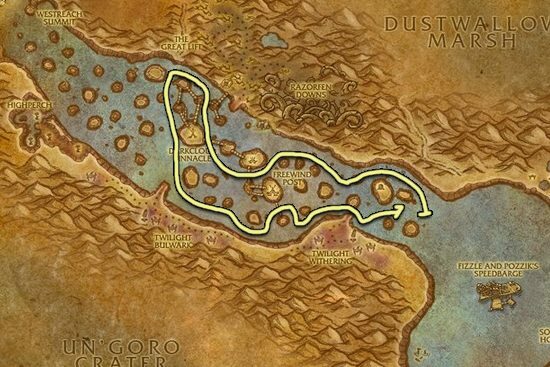 This zone is mainly for lower level Alliance players who can't complete the quest in Thousand Needles for the underwater speed buff.